Our pre-press department can design and layout your project, colour correct, modify and adjust your supplied files, provide scanning services, print colour proofs and prepare your artwork for the presses. If you supply print ready artwork, we will check your files before production begins. A PDF proof will be emailed to you in all cases. Contact us for a quote on these services. Visit our Resources page to view stock photos, design and font collections. We provide various printing services including offset, digital, and letterpress printing. Offset printing is ideal for large press runs in full colour (CMYK) or Pantone® colour match orders. If you need a job done in a short timeframe and smaller quantities (1000 and lower), digital printing is the best option. Colours will be converted to CMYK when digital printed. Letterpress orders are printed in Pantone® colours leaving an indentation in the paper for a one-of-a kind look. Photocopying services also available. 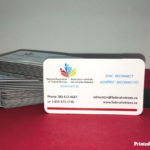 Contact us for a quote on your next printing project. Foil stamping, embossing and debossing are specialty printing methods that we produce in-house on a letterpress. The letterpress leaves an impression on the surface from a raised metal die. This old school printing process is distinctive, classy and can make your design impressive. Contact us for a quote. We offer a wide range of bindery and finishing services to complete your printed order. These final touches can really make your job stand out. For more information or a quote on our post-press services, please contact us. Products are packaged bulk (loose or stacked) in boxes. 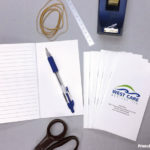 We can insert products into envelopes and bags, attach items to cards, gum tip and more. 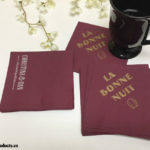 We can also custom print your bag tops, envelopes & cards. For more information or a quote, please contact us. Please feel free to drop by, or contact us if you have any questions. We’re here to help.